Sue has worked as a Parent/Child Educator for Nova Southeastern University’s Family Center for 13 years. 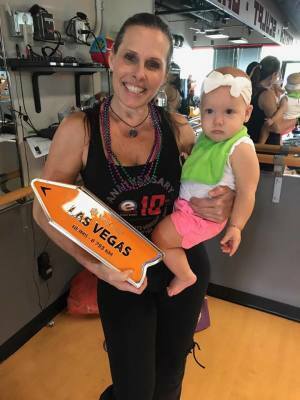 She has received her Early Childhood Development Associate Degree from NSU along with her Music Together Certification which gives her the experience to develop & create Infant/Toddler programs as well as be the Studio Manager for Ellen’s Ultimate Workout. Prior to teaching Sue has worked for Carnival & Marriott Hotels in the field of Sales & Marketing. I have been taking all my kids to Miss Sue's classes for the last 10 years! She is so wonderful with them and my kids have a ball. I love taking my 9 month old to Babies Rock. It's such a great way to spend time my my son and let him explore. Miss Sue is awesome! We go to Miss Sue's class every Friday morning. It has become a ritual and a great way to start the weekend. Her passion for music and children really shines. I literally have been to all of Miss Sue's classes. From Babies Rock at Ellen's to Circle Time at Beth Emet. She is just fabulous and my daughter laughs the whole time.